Happy new year to you all – hopefully everyone is enjoying/surviving this heatwave…sorry farmers….hooray for the grape growers, hopefully it will be a good vintage!! The course is looking supreme and is playing better than ever. Those of us lucky enough to play in this year’s Spark Pro-Am tournament were exceptionally grateful to the hard work of an army of volunteers that had a major clean up on their hands after the gale force winds that ripped through on the Wednesday. I understand that the chainsaws and leaf blowers were in action by sunrise! The day was a huge success and most enjoyable, with a fine banquet of food served after prizegiving! The winning professionals Mark Purser, Luke Kwon and Ryan Chisnall tied on 65. 2019 will be the start to a number of milestones or celebration for Waihinga Martinborough. On the first of April 1919 Martinborough inaugurated continuous service at the Martinborough telephone exchange with someone on duty all the time. Thus heading off both Featherston and Greytown which only had restricted daytime facilities. On the weekend of July 19 th 1919 Martinborough honoured her service personal with three days of events. 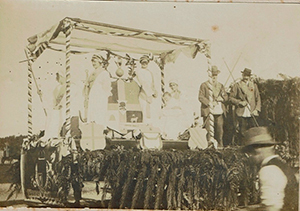 Saturday was ‘soldier’s day’ with with a parade of floats, a bonfire, dancing – night time dances must cease before midnight – football matches, a tug of war, and athletics. Edward Allen presided over a meeting of the organising team for the Festival on 14 January. Yes, that does seem early however there is much to be done. The Team are particularly excited by the prospect of mounting the Festival in the refurbished Martinborough Town Hall. This new venue does present new challenges which are better sorted out sooner rather than later. While there will be some who are disappointed the Festival is not returning to St Andrew’s Church Hall, the decision was also guided by the feedback survey to the 2018 Festival which indicated a preference for the Town Hall. The Town Hall has a reputation for a superior acoustic and has been compared favourably with the Wellington Town Hall, also said to have the best acoustic for a venue of this type in New Zealand. Wairarapa Shoebox Christmas which provides a shoebox filled with brand new presents for a child living in the Wairarapa who may otherwise go without or have very little at Christmas. The shoeboxes are funded by members of the community and the boxes remain 100% in our community.